Click the link below to open a Word doc. of Jeff's notes for Bible Doctrine, Chapter 8 (Part 1) that was taught on November 27th on the subject of God's Providence. 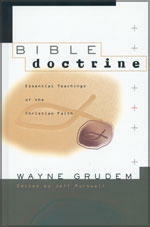 Remember, this will be a rough outline, but should assist those in Bible Doctrine Study Groups. For further study, click here to link to some other articles on God's Providence. Group Leaders, in lieu of study notes, please refer to the application questions at the end of the chapter to continue your discussion on the Creation chapter. Also, you might find the links below helpful. Please be discerning, as always, with the material on these sites (Acts 17:11). THIS SATURDAY...November 19th is a chance for God’s people to share in what is taking place on the other side of the world. Missionaries Brian and Anita Biedebach need our help and this is our chance to help them. 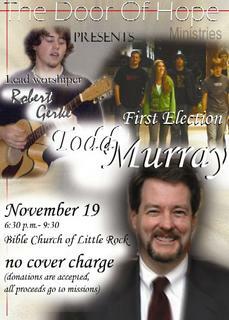 On November 19th, a concert will be put on by the Door of Hope ministries. Admission to the concert is free, but a love offering will be taken. All the proceeds that evening will be sent over to South Africa to the Lambano Sanctuary. Please come out THIS SATURDAY, November 19th at 6:30pm for a night of worship featuring the band First Election and BCLR Worship Pastor Todd Murray, at the Bible Church of Little Rock (19111 Cantrell/Hwy 10). 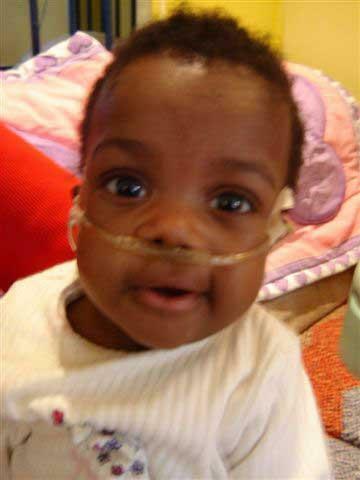 You can give financially towards this missions endeavor, and/or volunteer to help out. For more information and to find out how you can help with the event, email Jason Lapp. Here's a fun & yet edifying site...click on either of the pics below for a biographical sketch, or Click here to see other characatures of C.J. Mahaney, R.C. Sproul, D.A. Carson, Sinclair Fergeson, and other "Contemporary Reformers." Anyone wanna do a sketch of Crotts? Click the link below to open a Word doc. of Jeff's notes for Bible Doctrine, Chapter 7 (Part 1) that was taught on November 13th on the subject of Creation. Remember, this will be a rough outline, but should assist those in Bible Doctrine Study Groups. For further reading, you might consider John MacArthur's book, Battle for the Beginning. Click the link below to open a Word doc. of Jeff's notes for Bible Doctrine, Chapter 6 (Part 2) that was taught on November 6th. Remember, this will be a rough outline, but should assist those in Bible Doctrine Study Groups. When I spoke at Missions in the Main Hall Sunday night, I tried to give a biblical response to possible obstacles that are in the way for some people that may keep them from moving forward toward missions. My prayer is that God would use these responses to call more of you to go. Here are eight objections and a biblical response.